When I did a piece on Griff’s Burger Bar the other day, some folks reminisced a trampoline place in Cape. About the same time as that, I happened across these two frames shot at a SEMO football practice. 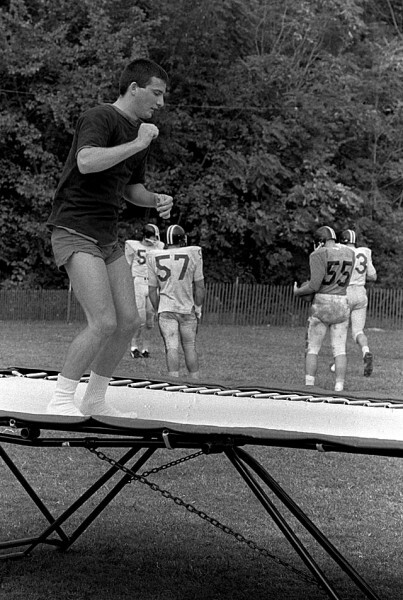 I don’t know if the trampolines were set up for the football players or if they were for something else. 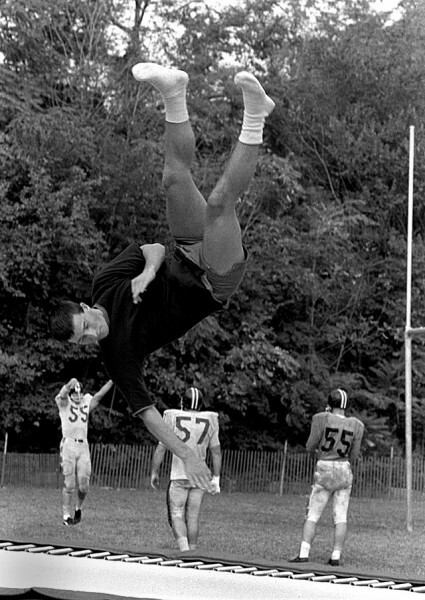 The supports and springs on that trampoline don’t look like they’d hold up the weight of the football players we see today. Maybe the SEMO Indians in those politically incorrect days were skinnier than the current crop. Wife Lila was confused by my “politically incorrect” comment. In an attempt to be more sensitive to Native Americans, the university changed its mascot from Indians/Otahkians to Redhawks; the university newspaper dropped “Capaha” from its name and is now known as simply The Arrow. Chief Sagamore, shown here in front of the Marquette Hotel during the 1966 Homecoming Parade down Broadway, has been replaced by Rowdy Redhawk. The local NPR station, KRCU, has a great feature called Almost Yesterday. It mentioned that there was a 22-foot fiberglass statue of an Indian Chief at the top of Houck Stadium. The statue originally graced the War Drum Resturaunt in Sikeston (which briefly became the location of the second Lambert’s Resturaunt (“Home of Throwed Rolls)). I’m not sure I have any photos of the Chief. When “Indians” became taboo, Chief Sagamore was exiled to storage. He was later sold to the owners of the Chaonia Landing Resort at Lake Wappapello, where he was lifted to the top of the lookout above the resort. I believe that is Tom Thrower on the trampoline. cica 1962. He later became head coach in the old MIAA conference. #57 may be Joe Critchlow from Sikeston. He played several years in the CFL. Those were the best years for SEMO football. Then the college egg heads had to inflate their egos and move football and basketball up to division one. This was the beginning of the decline for SEMO to play competitively. They also caved in and changed the name from Indians to Redhawks. Flroida State proved they were bigger than the NCAA and refused to change. I bet a lot of today’s SEMO students don’t even know that the mascot used to be the Indian. I owned a big palamino stallion, named Silver Dust, in the 60’s. Chief Sag rode him in the parade for 2 years. I believe it may have been 64-65. The college used to have a promo video showing the parade and my horse was in it. Off the subject a little … but still related … wasn’t it a wonderful city to be raised in as we watched these type parades that were full of enthusiasm for living. This type enthusiasm put-to-action earned us the title of an All-American City. Wonder what the name of the yearbook is now? Oh, I love political correctness! Bill, I wondered that last night, too. When I searched for Sagamore, I was taken to an archive where I could look at past yearbooks (neat). After you raised the question, I went to the official SEMO site, where I couldn’t find any references to student publications under student organizations. So, there you are. Alas, poor Sagamore, we knew you well. Glad I was able to turn your crank. A little bit of outrage keeps the arteries blown out. We are big supporters of Semo and of their athletics and they will always be Indians!! We honored the Indians with dignity. Chief Sagamore up on the hill with the fire going before a night football game and the singing of the national anthem and the alma mater doesn’t get any better. That is a memory that will stay with me forever! Go Indians! That Redhawk mascot is a total embarassment……. As a resident of the Valley of the Sun and frequent driver on the Piestewa (formerly Squaw Peak) freeway, I wonder about politically correct names. Now that we can’t call native Americans “Indians” any more, maybe we should also call cowboys “bovine caregivers.” We also have a plethora of place names containing “Indian” that still need to be changed. By switching to “Native American” and then abbreviating that to “N/A” we can make every incorrect reference “Not Applicable” and be completely SAFE! Thanks, Ken and Marsha Marshall Gutshall and BEV. You have truly amused me today. Of course, I agree with your sentiments! Ken, the mention of trampolines reminded me that there were in-ground trampolines at the southeast corner of Sheridan and Independence where Griffs Burger Bar was built. I remember going there when I was about seven or eight years old (1961-1962) with my uncle. As I recall there were about four or six and you would pay for a certain length of time on trampoline. I love the comments about the Indians of SEMO. I never thought of our Indians as mascots but as dignified symbols. Mascots have become too goofy. Janet Robert said it well. It is too bad todays students have no idea of the solemnity of the football ceremony, and the pride we felt. Still an Indian. Following the politically incorect trail from the Cape Woe-Be-Gone days when Indian football and basketball were more than sideshows, several youngsters made it a practice to visit Houck Field early on Sundays after home games. There they rebottled the dregs of the liquor left in the stands. One such bottle made it to the Franklin School playground c 1960, and given to a sixth grader who drank a healthy amount on a dare. The boys were not sent to Booneville or counseling. They might have received a swat or two. Ah…Chief Sag…an honorable representative for many years for the Indians. I grew up on Henderson and my back yard bordered the bleachers of Houck Field. Spent many childhood days running around the football field. 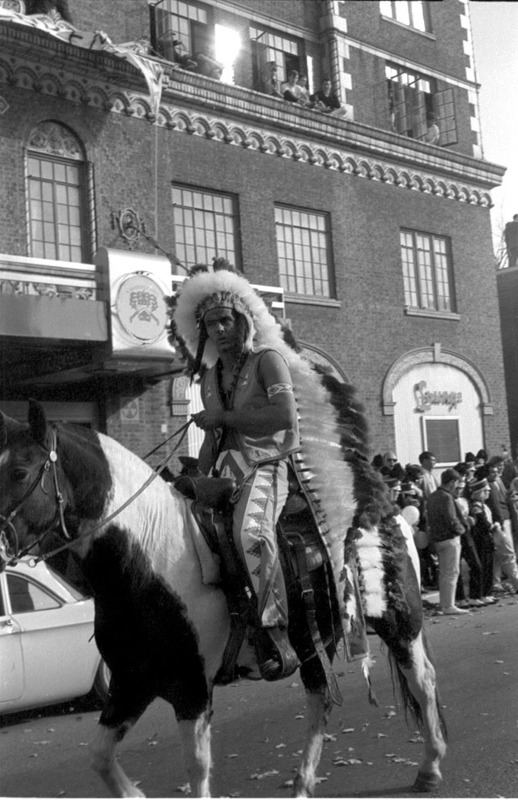 As a cheerleader for SEMO in the early 60s, I can still remember how picturesque Chief Sag was up on the cliff at the games…I was and am proud to be an SEMO Indian! Ditto to Sherry. Jim, Janet, and all. I was fortunate to graduate from Arkansas State University while “Chief Big Track” still circled Kays Stadium at a full gallop to Don Minx’s Marching Indians playing a smooth arrangement of “Cherokee” (Glen Miller)…. They lost me and my small alumni $$s during the last round of social/historical/revisionism/regurgitation. The NCAA is only the administrative/enforcement arm of the 300+ college presidents that make up that august assemblage. It was the professoriat at many seats of higher learning that began this trend of mascot political correctness, but the schools that prevailed against the politically correct tsunami (e.g. Florida State-Semioles) received the blessing of the respective tribes to keep the mascot name. The latest to fall was the University of North Dakota Fighting Sioux, despite an agreement by the school to refund something like $20 mm to an alum who gave the money to build a hockey arena, but only if the mascot was never changed. Moreover, our firm (though not I) represents the NCAA in this litigation which is generally contentious. We also represent and have regular dealings with numerous Indian tribes in Oklahoma on other matters. The call themselves Indians. I’ve never been corrected when I speak to or of them in that manner. Though objectively speaking, it is indefensible what the U.S. government did to the Indians in the latter part of the 19th century (witness the Trail of Tears), it appears that it is primarily us, the European-Americans who try to salve some long-buried imagined guilt by utilizing the more dignified ‘Native American’ moniker. Frankly, I prefer ‘aboriginal’ as is used in Australia. that is Tom Thrower.I believe the horse rider is from Dexter also named Glyn Jarrell. Chief Sagamore was proudly represented by the members of Alpha Phi Omega National Service Fraternity. During my days as a SEMO INDIAN, I had the honor of portraying Chief Sagamore several times. Since A-Phi-O has ties to Boy Scouts of America, we treated the portrayal as something sacred. I’ve heard tales told of the “drunken indians running around at football games” … Nothing could be farther from the truth. It was an honor and a priveledge to serve as Chief Sagamore, and I was terribly sorry to see it go. A couple of us A-Phi-O brothers still have the incredible Chief Sag costume (not the one in the photo, but an incredibly detailed hand-tooled leather costume). I offered the costume to the SEMO Museum at the River Campus. When I told them I had an incredible piece of SEMO history, they were interested. When I told them what it was … I never heard from them again. The costume is now in a safe place, and is lovingly cared for by A-Phi-O brothers who were proud to portray Cheif Sagamore. Glad to hear you’ve managed to preserve some SEMO history, even if SEMO would rather forget it. I got a frantic call one night from someone looking for a headdress for Chief Sagamore. Apparently someone had misplaced it. My dad, brothers and I were active in Order of the Arrow, so we were going to come up with one, but we got a second call saying that it had been found and to stand down. As a SEMO alum of ’87, I’ve stubbornly refused to acknowledge the Redhawk! I’ve been on a several-year hunt for anything that reflects the Indian name or image for preservation. I was helping my daughter (a Mizzou student) try to bring back their yearbook, the Savitar when she asked me if I knew about the status of the Sagamore. Sadly, I’ve recently become aware that it’s long gone! I know things change, but sheesh! I feel like so much of the history of my university is slowly receding! I am currently at student at SEMO, and I’ve read so many stories online of Chief Sagamore standing on the cliff or the hill before football games with the stadium lights dim and a fire burning. Just the thought of it seems like it would really get the crowed and the players into a game. I was wondering if anyone had any pictures or video of this, or any other pictures/videos of him for that matter. I have read a lot of articles on the name change out of pure interest, and I do somewhat wish that they were still the Indians. If they absolutely HAD to change it (which seems like it wasn’t the case at the time), my only wish is that the Redhawk wasn’t so much of a playful mascot. Rowdy Redhawk just seems too childish to me, and I wish that we had a more intense mascot that you could really use to get the crowd going like it seems Chief Sagamore did, from what I’ve read. Thanks for the info in advance. I’m scanning some SEMO stuff right now of campus construction in 66-67. I’m not sure when it’s going to run. I covered most of the college sporting events, so I’m sure I have some Chief Sagamore photos. When I finally get around to digging in the sports negs, I’ll keep an eye out for him. I’m glad you found us. Jack McDonald was close. 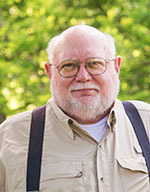 Chief Sag was Glayn’s brother,Larry Jaarrell. Glyn would have been only 13 years old in 1966. As a Golden Eagles band member in 1987 & 88 we were lead on the field as part of pre-game by Chief Sagamore and Princess Otakhi. This was a solemn and noble portrail. It was Definately an honor for these students to serve in the roles. I was so disgusted that when the university asked for public input as to a new mascot I suggested spineless ameoba. I was curious as to whether anyone might have any information as to the War Drum Indian. I came across some quirky allusion to the phenomenon of the “Muffler Men”. 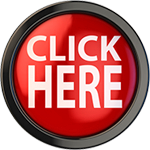 On this site, it refers to the fiberglass Indian statue as a “Muffler Man”. I am younger than some of the others viewing your blog, but am edging closer to my fiftieth year early next year. For me the Indian was always around, greeting me upon my return to home as a child in the car and after I began driving myself. I got to see him mounted on the stadium briefly while I attended SEMO. Does anyone know the origins of the Indian? Was he a repurposed “Muffler Man”, or was he constructed solely for the use of the War Drum signage? I have seen a variety of comments on forums like Topix, but no one seems to offer up much of any information other than reminiscing of cruising around it along with the Bulldog Inn. It also seems odd that there are almost no pictures of the signage when it was such a prominent part of the Sikeston view from I-55. When they changed to Redhawks I forgot how to write checks.